The backs are the easy part really, unless we sacrifice a little detail there for a circuit board. Without the circuit board, it's possible. But as you can see, wire management is a mess! 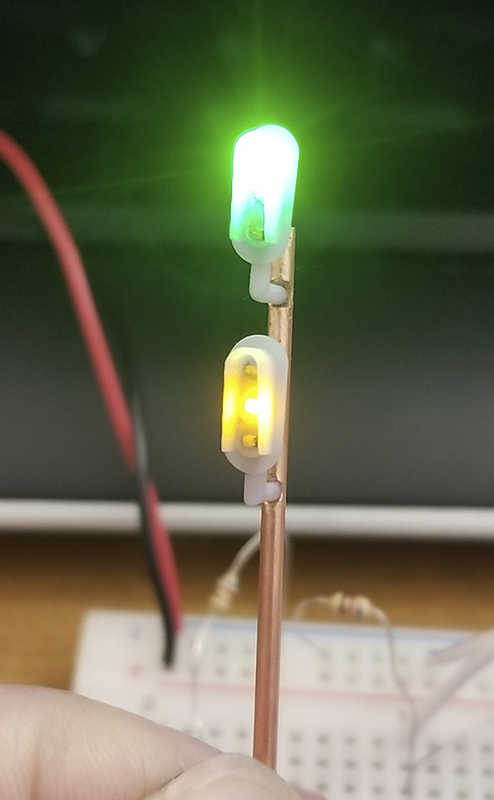 6 LEDs, 12 wires, 2 fully functional signals! These are just the raw print. I hope a coat or two of metallic silver will help the opacity, and I could turn down the brightness a bit too. @Mark W That looks like a winner. You've proven it can be made to work. If you want or if it would help I can drill those holes in that tube very precisely and very on size. No wobble marks on entry, just the hole. To that end, what size is the tube and the hole? Or maybe more precisely, what would you want it to be? Done and done. Package them with the LEDs and the brass tub and you will have a popular addition to your product line. @Mark W 's proof-of-concept here demonstrated surprisingly good results in modeling 3-color vertical signal heads with the Photon 3D printer. It's a great start, much improved over SW versions due to the minimum thicknesses of SW output. Like I said in the other thread, I'm no expert especially with dimensions other than the couple I have in my 1:1 collection, so any and all correction or enlightenment is encouraged. Three popular target widths, 24", 30" and 35" (36"?). 24" is mostly modern. Top and bottom target radii are centered on the top and bottom roundels. One significant exception is a "slim" 24" type seen on ex-SOU lines (and probably others), where the radius "clips" the bottom of the lamp housing, and the bottom lens has maybe a couple of inches of target below the lens ring. I hoped to have photos of local versions, but I didn't move fast enough when the PTC Vader-izing crew came through town two years ago. Consider 2, 3 and 4-color variants. Lens center-to-center is 12"
Outer doublet (lens) is 8-3/8", the retainer ring is about 1-1/4" wide and 3/8" thick. Visors - there are several shapes of visors, but by and large they amount to short, medium and long. Modern long in the picture below. Hoods - two major distinct versions, modern, and not-modern ; the profiles are different. There are some variations in the older style including things like a top baffle. The older style is still found on UP mostly on intermediate signals. UP, GN and I believe the Canadian roads used the old-style hoods as intended for snow defense. Shop-built hoods exist, with rounded square corners rather than the radius top. Very rare in the US... unless it's the RR you're modeling. Seem to be common in Europe. Hoods and visors are not mutually-exclusive. I have seen photos of old-style hoods with a short visor over the bottom roundel. Backs, as mentioned previously, can be lumped into three styles - cast "one piece" (housing with a single door), modular square aluminum (early Safetrans and other makers), and Safetrans plastic modular (round-ish with mounting ears). The most vexing problem (to me) in modeling is building heads with SMD LEDs in quantity. Proofs-of-concept, OK, but multiply the effort by 50 or 100 or more and it becomes a task of diminishing returns. We'll need mounting brackets and bases. @Wutter has a good Safetrans base on SW, the relay cases and different base from Showcase Miniatures solve the mounts, but pole brackets will need to be developed. Modern pole brackets (photo below) with wire feed-through may be a challenge; old-style typically has external conduit making the job a lot easier. By sheer coincidence, last night I was dinking around with PCB software trying to create a micro-PCB with three 0402 LEDs that would slip into a 3D-printed back. 0201 LEDs aren't necessary in this case as there's plenty of real estate for the easier-to-handle 0402 size. My design concept was a 0.012" two-sided substrate, component placement on front, with vias (connections between the front and back layers) bringing the connections - R-Y-G and common - to pads on the back for wires. This, I think, works well with Mark's hollow-back concept. I would expect the board to be commercially-produced as a populated fret with multiples of RYG micro-boards in 1/16" strips you would cut off as needed. I would also populate the fret with a small handful of less-common configurations such as R-Y, R-G, R-Lunar, and R-Lunar-Y. 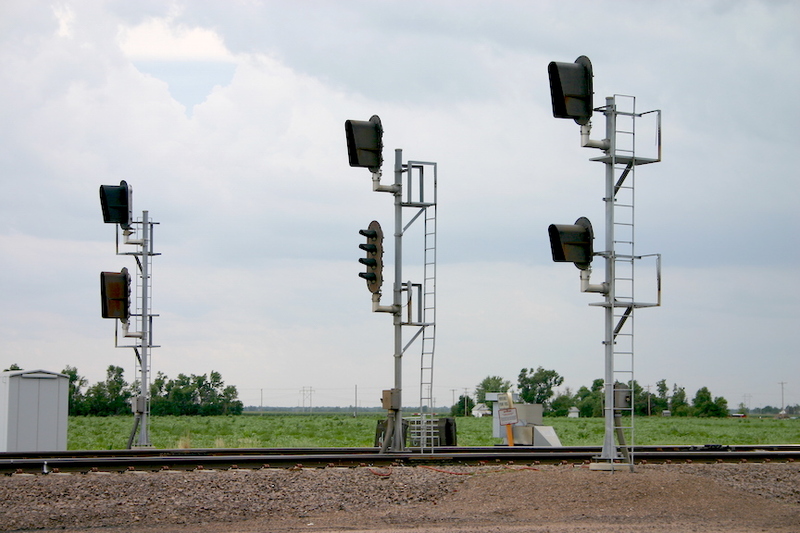 Maybe also a R-Lunar-Y-G or two, not as rare as one would think, as here are two on UP at Kearney, NE (two left lower heads), and the 4-indication heads were standard practice on Soo Line. The PCB software I was trying to make work was awful and there was not, for instance, a way to plot a small plated-through via, nor was there a convenient tool for routing (as in machining cutouts, versus circuit paths). If somebody here was handy with a CAD package that exported finished Gerber files, we might be able to do this. None of my handful of CAD apps will do Gerber. I'm hoping this to be a community effort. @Mark W has certainly taken the feasibility lead, now we need proto references ( @robert3985 and @draskouasshat , I'm calling you) and somebody with Gerber file capability. I'll do what I can in finding additional photos and maybe blueprints, the latter has proven challenging. With Gerber files in-hand I can certainly front finding a reasonable PCB assembly house to do the LED frets. Don't everybody jump on me all at once. @Mark W , Mark...I'll be happy to provide every drawing and photo I have of both Transition Era (1947 through 1956) type D Signal Heads as they were on the U.P. up Weber and Echo Canyons during that time period, and as they appeared in the 21st Century (very weathered and in bad need of paint) before they got replaced by the new signals, which you already have plenty of references for. Let me know when and how you would like these references which I believe I've posted in separate threads here at TRW over the years. I can also post several photos of my own scratch-built brass versions of the early D-type signal heads with the big hoods, which are capable of being lit, but are very U.P. specific as they're mounted on iconic U.P. riveted iron cantilever signal bridges. Um, print them in BLACK RESIN. Black is on the way, but I 'm sure they'll need a masking coat. @narrowminded yes, that would be awesome! Right now I'm just using the smallest K&S tube I could find. @C855B mentioned a few smaller options may be out there too. And with the help of @robert3985's drawings, we'll have our measurements! Then we just need to get @Lemosteam in on it with the photo-etched ladders and platforms! @narrowminded yes, that would be awesome! Right now I'm just using the smallest K&S tube I could find. @C855B mentioned a few smaller options may be out there too. Yes, even with black resin you mill likelyneed to make those signal heads light-tight by painting them. The other thing is to reduce the LED brightness. I don't think they will need to be nuclear-fusion-bright. The 1/16" tubing diameter from K&S is way too large for close to scale signal mast. Mike uses stainless steel (hypodermic tubing). 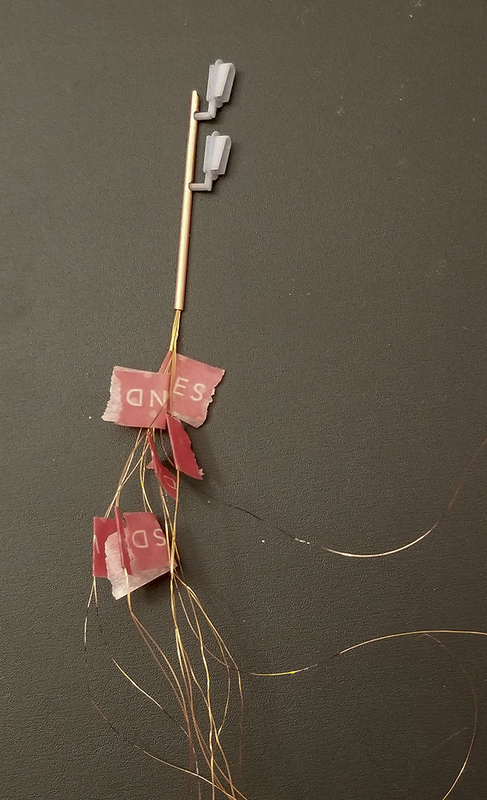 I don't think your signal head's stems can be printed small enough to fit into a hole in a side of that tubing (while being hollow to pass the magnet wires). Not trying to rain on your parade - just looking at this from a practical perspective. Yes... the 0.032" OD surgical tubing from ngineering.com is scale size for the standard 5" OD signal mast. Showcase Miniatures uses the 3/64" thin-wall (0.005") brass tubing from Special Shapes/K&S; it corresponds to a 7-1/2" OD pipe. My inclination for a large project would be the 3/64" primarily because of the Showcase signal boxes, ladders and brackets which are appropriate for my modeling era. It is enough reduced from 1/16" "standard" K&S tubing to lose that clunky appearance. Judging from what Mark has achieved in those elbow brackets it seems to me they would look about right with the 3/64" (0.047" or 1.25mm). Just my opinion. Noteworthy... I have been successful with two four-wire bundles in the 3/64" tube, and came pretty close to getting 12 #38 wires down the mast in a couple of tries. I'm sure with a little bit of very careful reaming the tube can handle the wire from three populated heads. I am tearing my hair out - what's left of it - coming up with a reasonable and timely repeatable solution for the LEDs and wiring. Proof-of-concept is one thing, but when I'm staring at the prospects of 150 or so heads it's got to be fast. I've been dwelling on the circuit board approach, concluding that it will not be fast insomuch that I am not really a PCB designer, but especially do not have any relationships with PCB pick-and-place production houses, and anticipate the unusual requirements will result in a lot of (expensive) back-and-forth with the production house getting populated boards we can use that we still have to attach wires to and will have the added thickness of the board. Pete, after doing parts research I think the end game with LEDs is probably going to be hand-soldered 0603s. Board or no board, we're still going to be hand-soldering wires. I like the Kingbright "domed" APTD1608 series in 60° for this project for several reasons. First, 0603 is about the smallest we can reasonably expect to do in hand-soldered. You and I have done 0402s, but a cough, sneeze or even a heavy <...sigh...> has sent more than one 0402 flying off my microscope stage never to be seen again. Second, 0603 are 1/16" x 1/32". That's about right for the chip to fit horizontally relative to the target and back. Then there's the lensed chip for focus, rather than spraying light everywhere. Also, Kingbright domes are available in the "correct" yellow (590nm) and "correct" green (525nm), and there's even a cool white for the lunar indication I want in several locations. Finally, the domed chip should make it easier to build a soldering jig out of, say, a small bit of aluminum with drilled holes for the domes. Mark, what size LEDs are you using in your proofs-of-concept? That sounds like a good design. Labor-intensive, but doable. I held a soldering iron set to 600 deg.F to the gray resin and it did not have any effect on it. 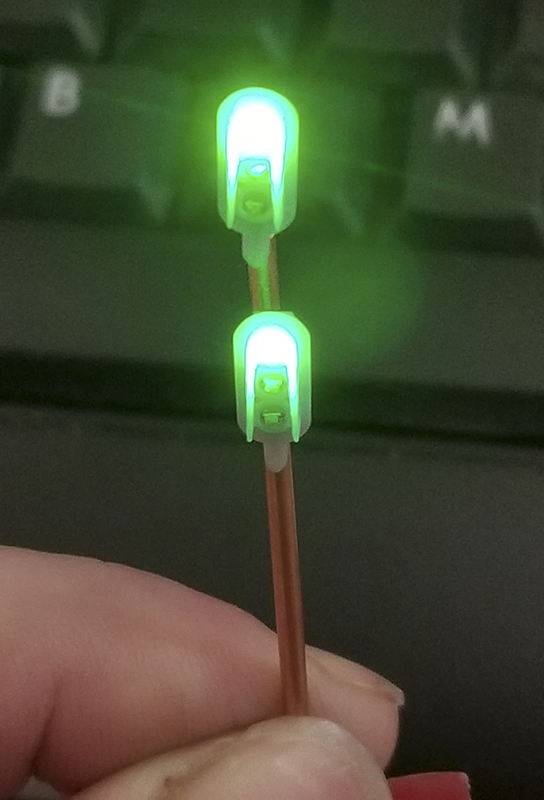 So if you design the signal head to cradle the LEDs, it will safely hold the LED while being soldered. 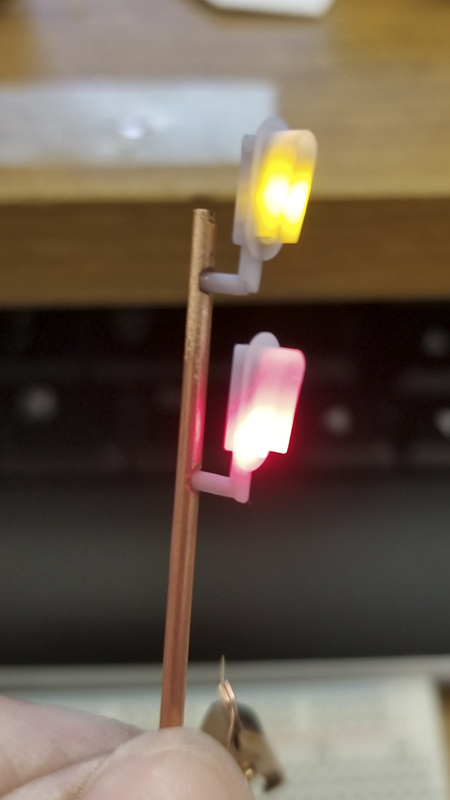 If you also design and print a fixture to hold the signal head with the back facing up and horizontal for soldering, you will have a very stable way of soldering the LED wires. A couple of suggestions for making these. First, if you're going to try to use 3/64"x .005" wall tubing the ID will only be .036", just over 1/32". So what size hole can you realistically have? 1/32"? That hole will have to accept a spigot from the resin printed head with at least 4 wires passing through it. And those wires will have to be turned at entry and fed down the tube. Am I the only one seeing the proverbial 10# of something in a 5# bag? And another way might be to make something along the order of what John proposed very early on. It basically saddled to the tube but had the housing right up against the tube. What I think could be done would use a saddle for the tube which would give a good, robust attachment. The head could have all of the features it should have including the spigot for mounting but at the end attachment to the tube would be a saddle that gives a good attaching face and also could be used to cover a milled slot in the tube that gives some advantage to the angle for feeding the wires through. OR, using a mix of the concepts above, (I think I like this one) there could be a rear saddle half, with some U-bolt detail, in addition to the one on the head and you could go back to straight feeding wires in simple cut off tubing and the two saddles, front and rear, could make for a very robust attachment and support for the tubing. And a second tube could project from the top to complete the ensemble. 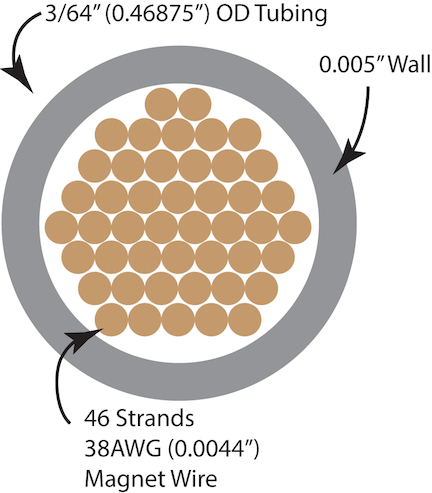 FWIW, the 3/64", 0.005" wall tubing is a known quantity on a high-quality kit for SA-type (searchlight) signals. Example here, which is what inspired this whole conversation: https://www.therailwire.net/forum/index.php?topic=24108.msg602855#msg602855. I've been successful (as have others) threading eight #38 wires for a 2-head mast, and with a little skill I think 12 wires are possible. You're right, however, about moving away from inserting the elbow fixture into the tube, it will need to have a saddle end to glue to the mast and over the entry into the mast for the wires. A simulation of the U-bolt flange will help with glue surface. I'm not in favor of a "full saddle" for the head as John suggested, it takes us back to my sore point with model signals, sacrificing modeling fidelity of the back of the head. With what Mark has done we're close to eating our cake and having it, too. Excellent. Makes life much easier. I can deal with that. I have been saying this for years. I have used FXD as a pewter mold. I held a 900 degree iron to FUD, FXD, and the anycubic resin parts that @Chris333 sent me and this crap don't melt. It will harden and shatter with extended exposure to a tip, but for s split second touch, it should be fine. Nope - that is exactly what I mentioned in post #21 in this thread (few posts above yours). Practically speaking this can never happen, but it conveys the amount of relative space we have to work with. I don't see any issues.